lid, and that the Fitts and Welford formulations are valid. validity is an ill-conceived and meaningless construct. published sources which are also available online [2-4]. formulation was “more valid” [1, p. 205]. rances or widths are like noise. Theorem 17, with the +1 removed [6, p. 388, 7, p. 157]. tical situations” [6, p. 388]. 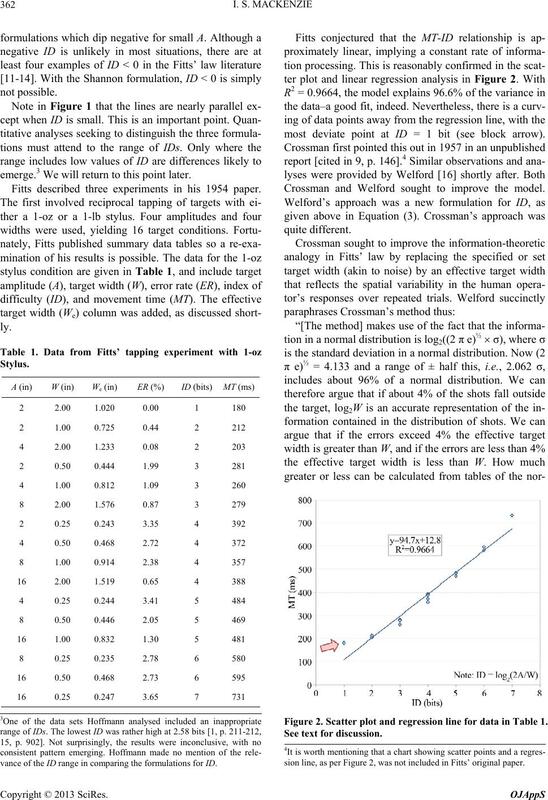 target A = ½W” [9, p. 147]. emerge.3 We will return to this point later. Fitts described three experiments in his 1954 paper. most deviate point at ID = 1 bit (see block arrow). Crossman and Welford sought to improve the model. vance of the ID range in comparing the formulations for ID. Figure 2. 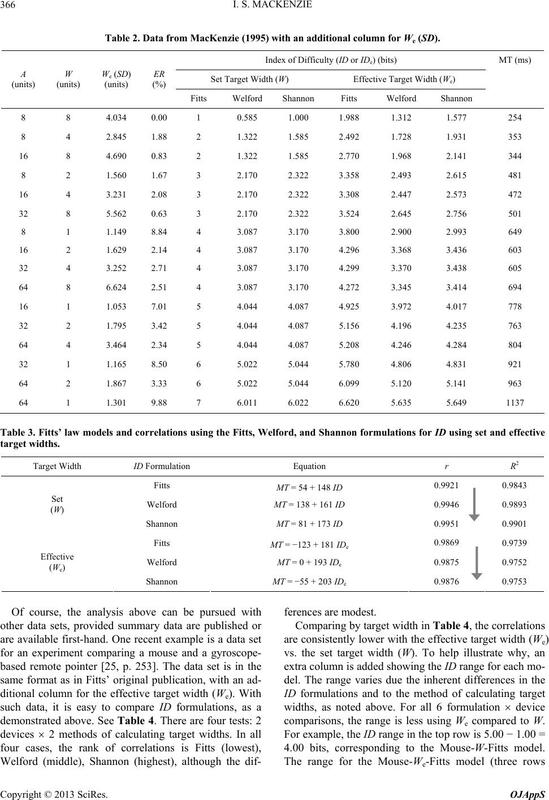 Scatter plot and regression line for data in Table 1.
sion line, as per Figure 2, was not included in Fitts’ original paper. dard deviation (σ) is computed directly, with We = 4.133 σ.
effective target widths. This is presented next. a straight line which passes through the origin” [9, pp. 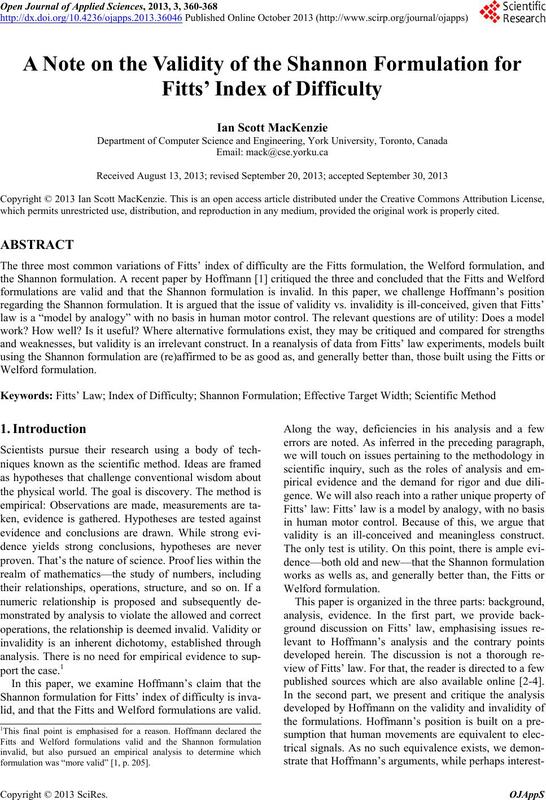 tion; (b): Shannon formulation. Source data: Table 1.
stitution of an amplitude in place of a signal power” [1, p.
communications systems with those of human movement. term. This point is examined next. formulation (invalid) and the Welford formulation (valid). ment on the basis of signal power or continuous signals. and which has been available online since the mid-1990s. a tablet [19, p. 485]. 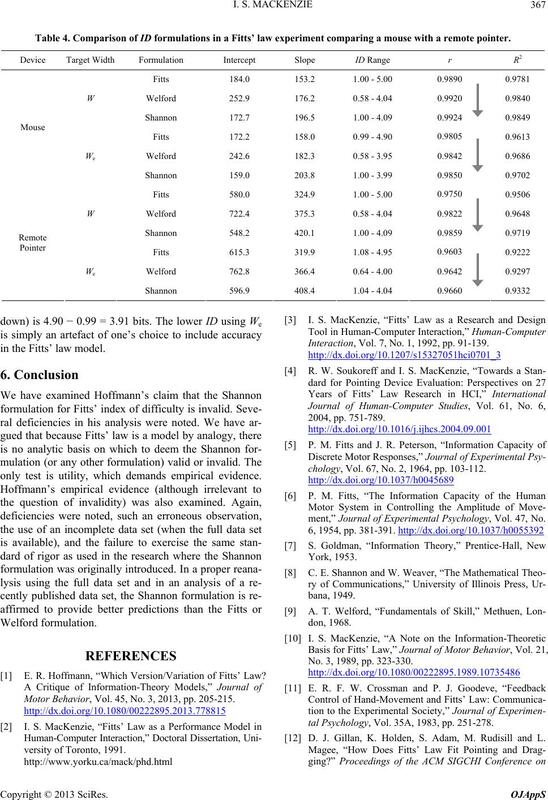 models for the Fitts, Welford, and Shannon formulations. the regression” [1, p. 212]. 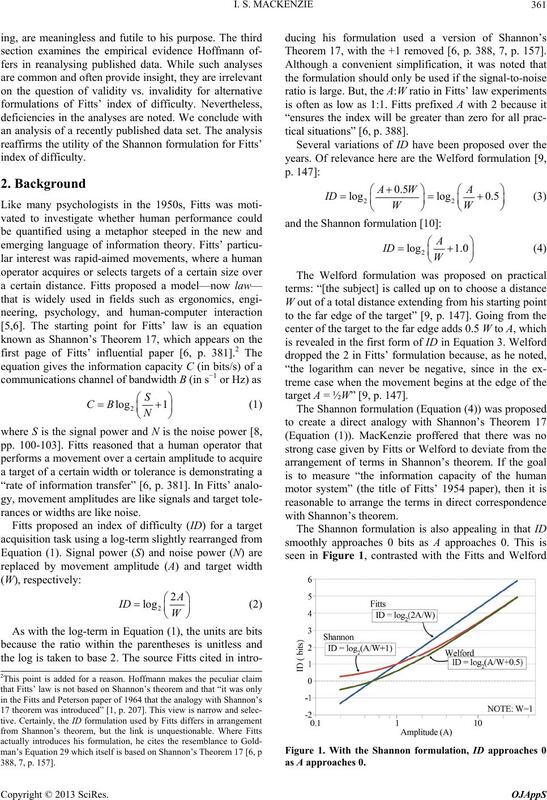 are highest using the Shannon formulation. Table 2. Data from MacKenzie (1995) with an additional column for We (SD). comparisons, the range is less using We compared to W.
4.00 bits, corresponding to the Mouse-W-Fitts model. Table 4. 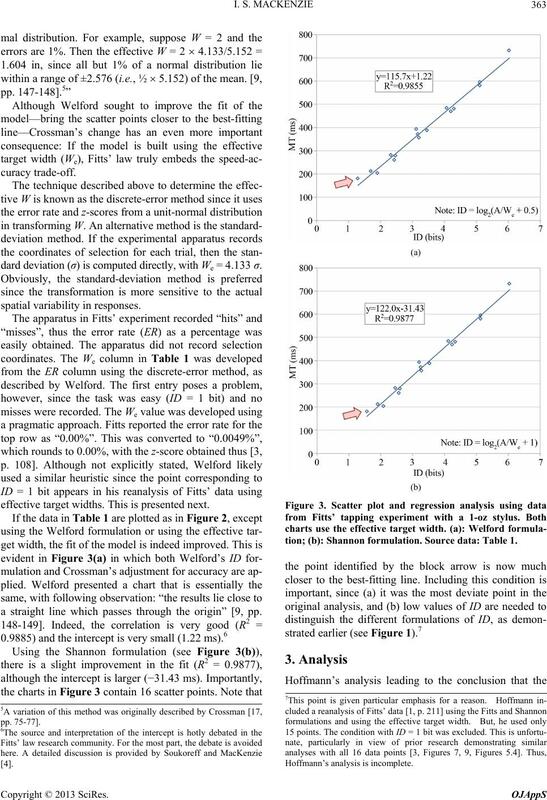 Comparison of ID formulations in a Fitts’ law experiment comparing a mouse with a remote pointer. in the Fitts’ law model. only test is utility, which demands empirical evidence. 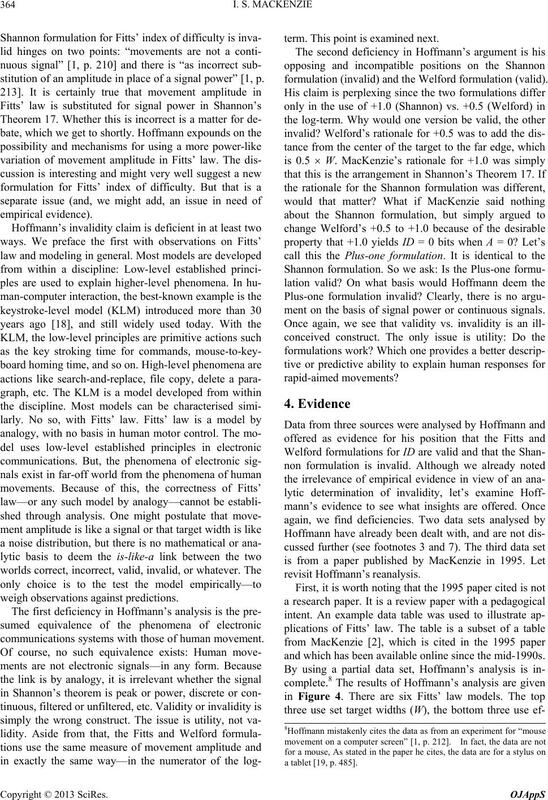 E. R. Hoffmann, “Which Version/Variation of Fitts’ Law? Motor Behavior, Vol. 45, No. 3, 2013, pp. 205-215. Interaction, Vol. 7, No. 1, 1992, pp. 91-139.
chology, Vol. 67, No. 2, 1964, pp. 103-112.
ment,” Journal of Experimental Psychology, Vol. 47, No. No. 3, 1989, pp. 323-330.
tal Psychology, Vol. 35A, 1983, pp. 251-278. D. J. Gillan, K. Holden, S. Adam, M. Rudisill and L.
New York, 1990, pp. 227-234. Vol. 21, No. 8, 1978, pp. 601-613. Motor Skills, Vol. 25, No. 3, 1967, pp. 901-904. No. 7, 1980, pp. 396-410.
mann, San Francisco, 1995, pp. 483-493. 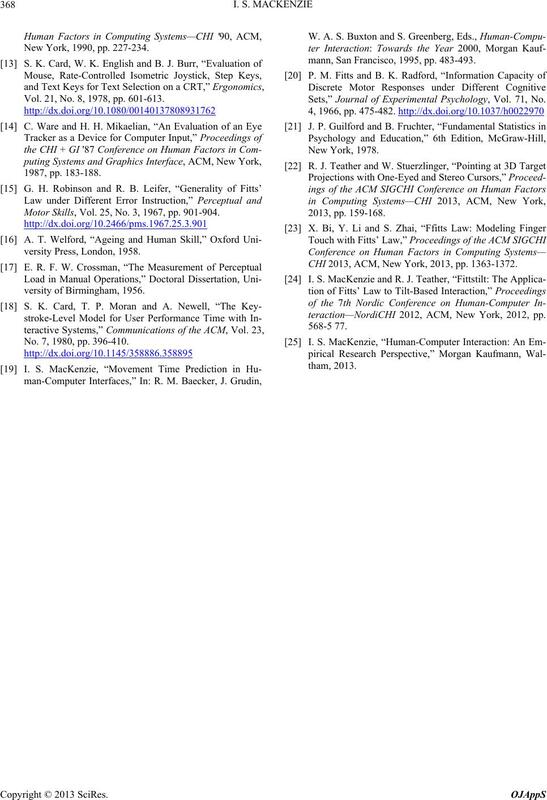 Sets,” Journal of Experimental Psychology, Vol. 71, No. CHI 2013, ACM, New York, 2013, pp. 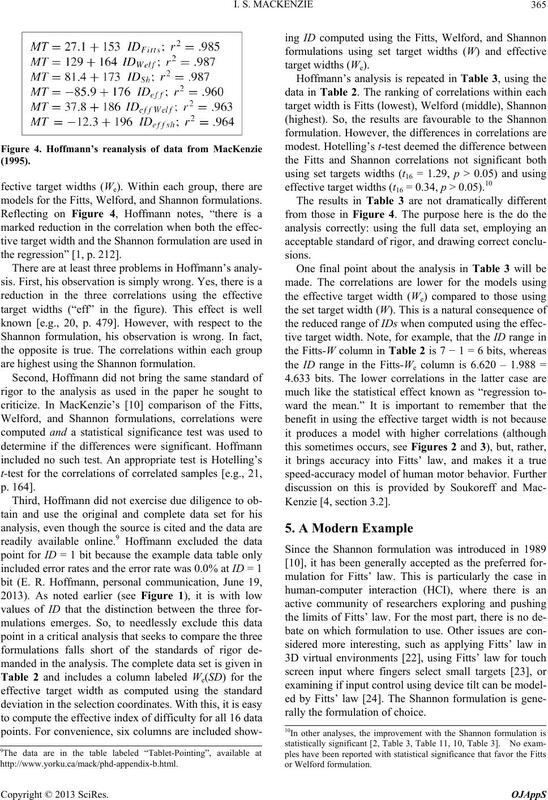 1363-1372.
teraction—NordiCHI 2012, ACM, New York, 2012, pp.